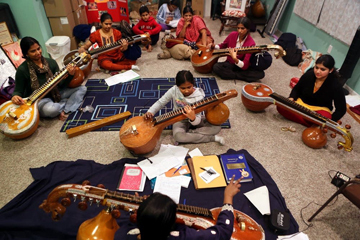 The academy offers Beginner, Intermediate and Advanced courses.In the Beginner course covers the basic seven notes and the perfection of swaras. The student can study swarangal, saralivarisakal, pallavi varisakal etc. The Intermediate course teaches Melsthay varisakal, Alangarangal, different types rhythms (Thalam) and much more. The students will be introduced the concept of paired notes and the patterns in which they could be sung. From the Advanced course onwards the student will start to attain a good level and will study Geethangal, Sworajathy, varnangal,classical songs and more.When the students successfully complete their courses, they can continue their study with different Ragas and Songs.